Table Size: 22" x 11"
Max. depth of cut: 6"
We are reckoned amongst leading and prominent industries for offering a large array of Mortiser Machine. The product we offer is used in wood working and many other applications. 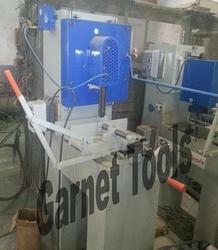 This Mortiser Machine is quality tested and known for their hassle free performance. We are instrumental in offering Chain Mortising Machine to our clients. The offered machine is design using high grade components and modern technology with utmost precision. These Chain Mortising Machine are tested for their quality and performance under the most extreme conditions to ensure its reliability. Max. depth of cut: 140 mm / 5"
Up/ down movement of table: 75 mm / 3"
Cross movement of table: 100 mm / 4"
Longitudinal movement of table: 305 mm / 12"
Table Size: 22" x 9"
Up/Down movement of Table: 3"
Cross movement of Table: 4"
these high quality Chain Mortising Machine are made from very high quality raw meterial which ensures hasile free work performance at its user end. these Chain Mortising Machine planner machine widely finds its applications in various wood working industries. Application: For Lock fitting in doors. High quality indian product.Own manufactured product.